Forget Google maps. Today, we are off the grid in West Clare. 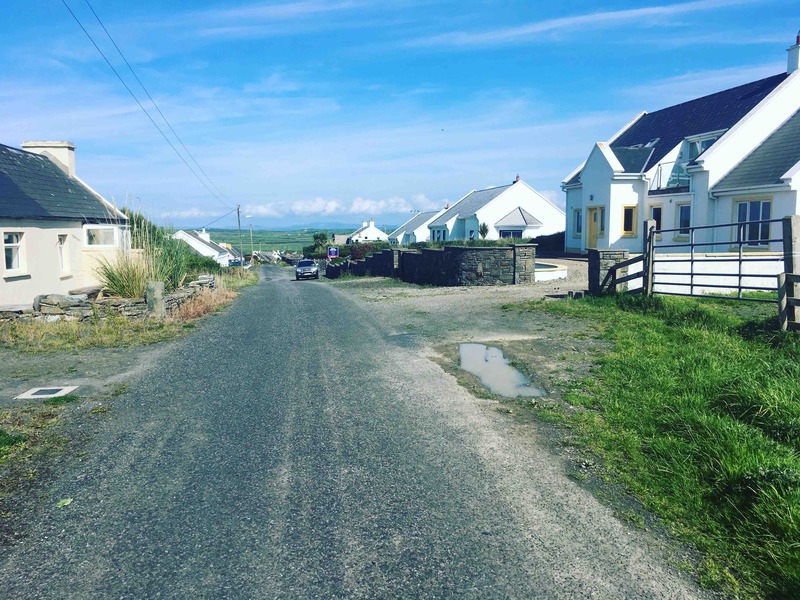 On the Doonbeg road 2km North of well known ‘Victorian seaside resort’ Kilkee the road-sign on a bare, ascending left turn announces “L2024”. L2024? You’d never guess that just over the brow of this hill, descending into the mighty Atlantic towards infinity, this modest boreen leads to what not so long ago was a thriving Irish language village of fisher folk, kelp collectors, and an award-winning storyteller with connections to Walt Disney. Pat Laffan in his living room channeling Seanachai Padraig (Croaker) O Briain. High technology! 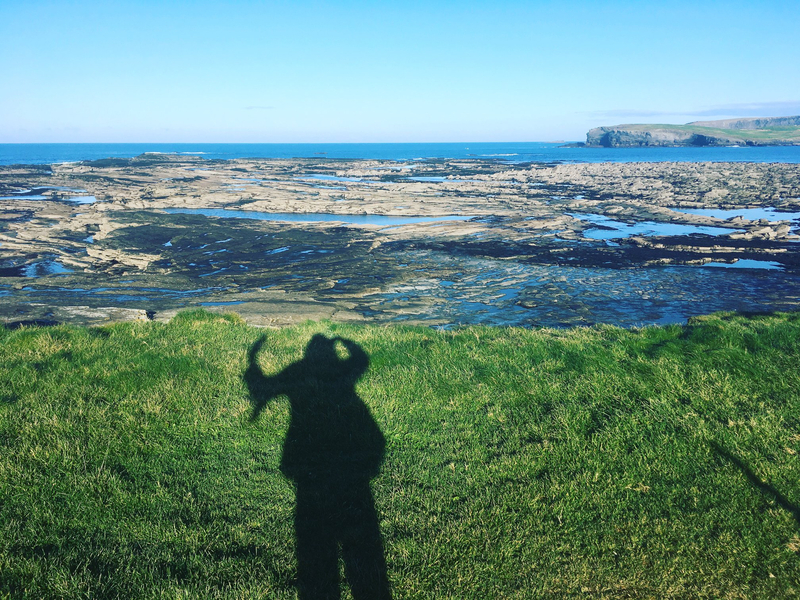 “I was the tenth of a family of eleven brought up in a little fishing village on the Clare coast known as Coosheen, two and a half miles north-east of Kilkee, on the fringe of the Atlantic. Coosheen village had twenty-two humble homes in the early nineteen-twenties, with a population of two hundred or over, all depending on the sea to earn a livelihood to enable them to raise their families. 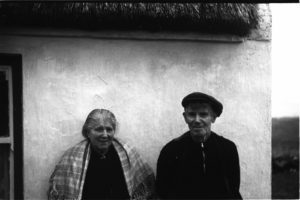 *** voice of Padraig (Croaker) O Briain from the 1950 recording by Tadhg O Murchadha, which continues underneath. “As a lad I loved every pebble, every boulder with green moss, every nook and crevice, round the shore and cliffs just below my home. I loved above all the pure simplicity of the old folk, the traditions, the great humour they possessed, their straightforward ideas, their many great legends, and their ever-endearing attachment to the Gaelic tongue, which they treasured and kept flowing freely amongst all, even among the young ones. 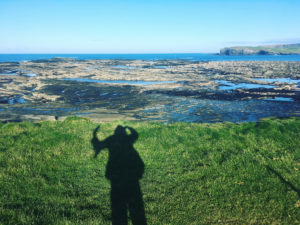 Turn up the 1950 recording here..
Deirdre/ Narrator: That’s the uncrowned Bard of Coosheen, Paddy O’Brien who lived from 1920 until he was tragically washed off the cliffs below his home in February 1977. 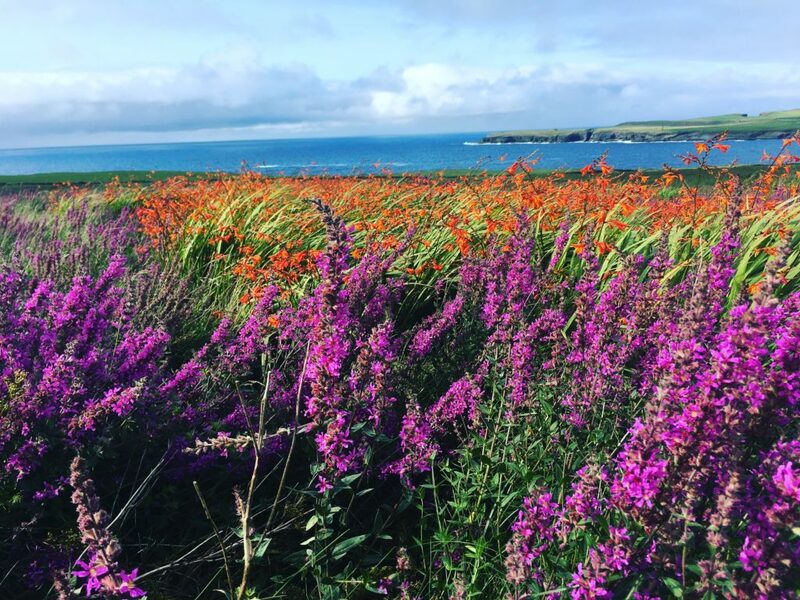 His paternal grandmother, who was pregnant at the time, had also drowned at the same spot where generations of his family precariously gathered “seagrass” to eke out a living on that wild Atlantic seabord. He made his mark though. INTERSPERSE COOSHEEN FOLK MUSEUM 1. VAL GEARY: He could make, as they used to say, a cat laugh. He was just naturally witty. Anyone that thought they were witty and to have a conversation with Paddy O’Brien – they were always way down the scale of being witty compared to Paddy – he was natural. VAL GEARY: He wasn’t a tall man, and from birth he had a pretty bad hump on his back. Now but it never, I suppose it may have held him back in some cases, but you know, he could fend for himself. He could do his turf and everything he wanted to do, but he was born with that. You know, so he was well known. Everyone knew Paddy. VAL GEARY: He spent all his life living in the village. So he was part and parcel of Coosheen. VAL GEARY: HE was no Bono but he was a pretty good singer. He just liked to make people laugh and that was his most talent. He always said something witty. To get you laughing or to get you. I mean there was no such thing as depression in the village. You could go to Paddy O’Brien and you come out feeling better no matter what because you knew he was going to be telling you stories or there’d be lies maybe in the stories, but it was better than feeling down. 17.00 Go into Paddy and sit down and maybe for hours be chatting away to him. Just fill em up once more! VAL GEARY: He just had to be scribbling away, he might be thinking away, he’d often go into the house and he’d be pondering away, but the mind was still working. He’d be 18.02 working on a song, there’d be something always going through his head. Always. VAL GEARY: I don’t think he done it for recognition or for payment. It was just something he enjoyed doing. IT was a natural talent. He could make up a song while he’d be talking to you. About you. VAL GEARY: And you’d know while he’d be at it because he’d be smiling mad to himself. As he was talking to you. I suppose if you had ever, which you couldn’t, but if you had ever met him 39.31 I don’t think you’d have met a 2nd one in the world no matter where you would have traveled. HE was just something else. He was harmless, he was funny, he was a great neighbour. You couldn’t say anything bad, or anything wrong about him. If you did you’d be telling lies. D/Narrator: Although we never did meet this special man, my brothers and I spent many childhood summers in Paddy O’Brien’s little fairy cottage – the brightly coloured former modest abode that used to lure passing tourists – and in a caravan just outside it, while my parents, Limerick teachers based in Canada, built a traditional Irish cottage on the poet’s beloved Coosheen site. In that famous college green. To brand us on the map. Anne Daly: I tell you something – Comedian – he wrote poems, plays, anything. And anything that happened around the area. he was off home, the pad was out, and – it could be funny, it could be very serious, now he wrote some things and I’ll tell you – if they were ever found, we’d be in jail. Because I’ll tell you – he was a holy fright. And a very funny humorous man, you know? But myself and himself had a great old bond, you know? We just liked one another’s company because he was funny, But Paddy was a howl, oh my God. Anybody and – people would say “oh he’s living alone”. He was never alone. There was always people, pulling up there. Have you this Paddy? And Paddy would give them this poem, and that poem, and the next play, and something else, and then – we never see him any more – you know? Anne Daly: He’d be sitting outside, in his chair and anyone that would come along, sit on the wall, the stone wall, and he’d be telling his stories to all those there’d be yanks and there’d be English people and they’d come and they’d see the small little house you see it was the small house that had the attraction. Because they’d see this little fella sitting there 24.04 on his chair, look at, and he was cute, because he knew that those people – that’s what I used to say to him – you’re cute, you’re very cute Why? Sitting outside the door on the chair and you waving to everyone. And then it was the house, the small little house, that got anyone’s attention. 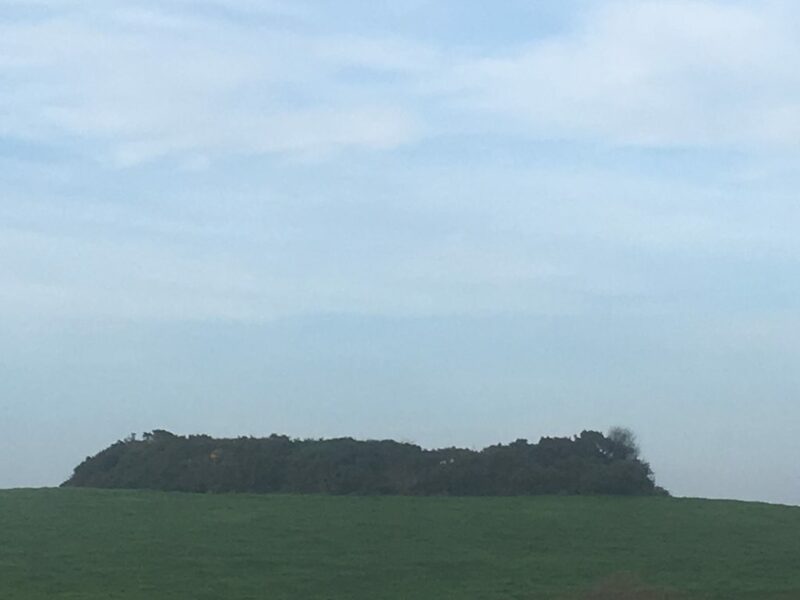 When you’d see the size of that little house there. And this fella sitting outside, so… He’d have visitors every day of the week, yeah. Anne Daly: It was, and I think, to look at him, I’d see it myself when I would come up and I would look at him – and he sitting outside the door right, and people pulling up, in their motor cars – how are you? Come in. Sit down, on the wall yeah yeah…. Wouldn’t anyone stop at the side of the road, any American, that would love to see Ireland as Ireland would be, isn’t that what you’d see. Anne Daly: he’d be saying wait until I tell you now, this car pulled up and I’d say “right”. And these people came up and they came back the next day, but they brought me a drop of whiskey. Oh they did of course I said, feeling sorry for you with the small house outside the door and you sitting outside on your chair. I’ll cover many a mile. Anne Daly: He used to sit outside there right there at that side. Not at the other side. There. And he’d leave all that little part then, and he’d be there. At this corner here. And anyone that came then it’d be here, sit up here. There you go, yeah. And people were coming. Anne Daly: He’d be telling them his stories. And he’d share the poems, and he’d given them some if they wanted them. They’d pass on the word to somebody else, and the next thing, there’d be another carload, and that. But Paddy was never on his own here. Paddy had more people visiting than the town would have for the summer. They were coming, and going, and they came back then the next year or the year after, and they still came to see him. Because he was that type, he loved company, and he loved telling stories, and then a few jokes and he was witty and funny, and they just loved him, and that’s it. 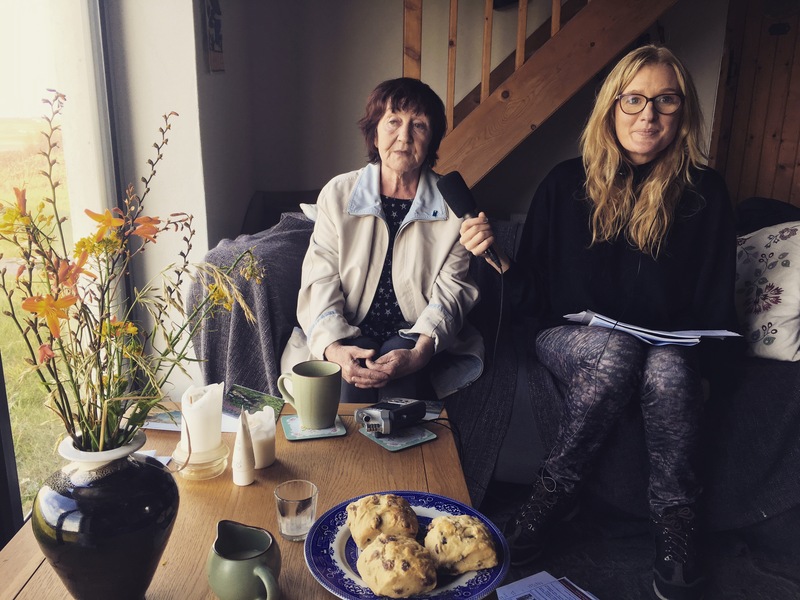 Anne Daly: there was always someone calling to see what new piece he had written. Did he write anything new? Which he did, because he was always putting something down. But he was never – I would never say he was lonesome, never, because there was more people visiting him than 30.59 the president above in the park, you know? [laughs] Because that’s the way he was you know. So we’ve decided to take it on loan. To a far off land from our lovely strand, to the shores of America. Where each thatched cot, was a beauty spot in the village Coosheen. Anne Daly: I’ll say you could imagine I suppose the 1920s 30s 40s, even the 50s, emigration and poverty was something else around – not alone in the village here but all around the country there was no work, and people was devastated to see all their family going and sometimes they never came back home, once they went. They looked after, and sent some money home to their fathers but some of them never came home again. Where the Gaelic tongue so often won many honours for Coosheen. D/Narrator: The Gaelic Tongue? Today you’d never guess it, as there is no Iar-Ghaeltacht sign on Coosheen village, now mostly holiday homes – in fact there is no sign of any sort to mark Coosheen village – but this was one of the last Irish speaking villages in County Clare. Weave underneath 1950 Clare Irish recording “An dTuiginn tu? An dTuiginn tu?…” etc. Anne Daly I would say the most of the people going back would be native speakers. Because that’s the only thing they would have conversed in, is the Irish. 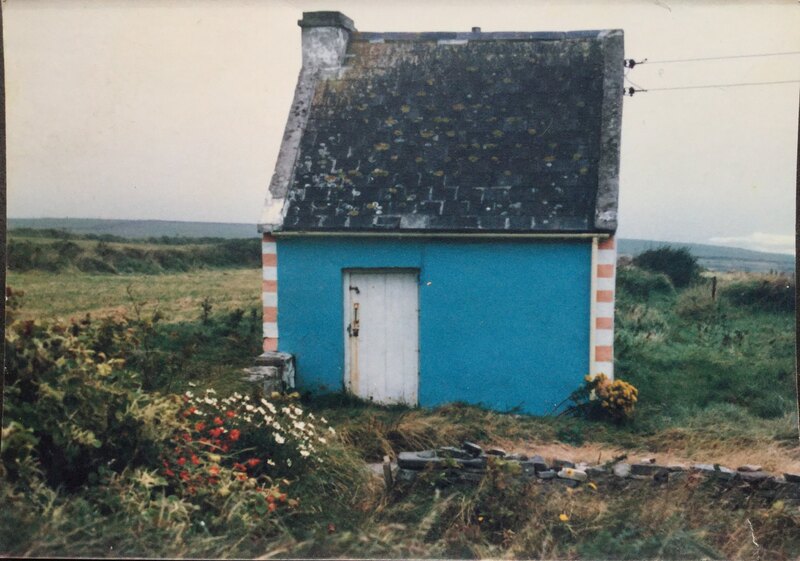 D/Narrator: My own father, Paud Mulrooney, who was born in 1941, remembered being brought through Coosheen village as a child for the first time by his father, Garda Paddy Mulrooney – one of those who opened up the first Garda Station in nearby Doonbeg. Dad’s memory was of a bustling place where everyone was speaking Irish – a far cry from what it is today. PL: The Widow Ó Réidhthe’s Son? Well now, if I had known you’d come again so soon…. I’d be- everything bit by bit, an dtuigeann tú? A poor widow lived over in the west long ago. And she only had one child, Seán was the name of that son. 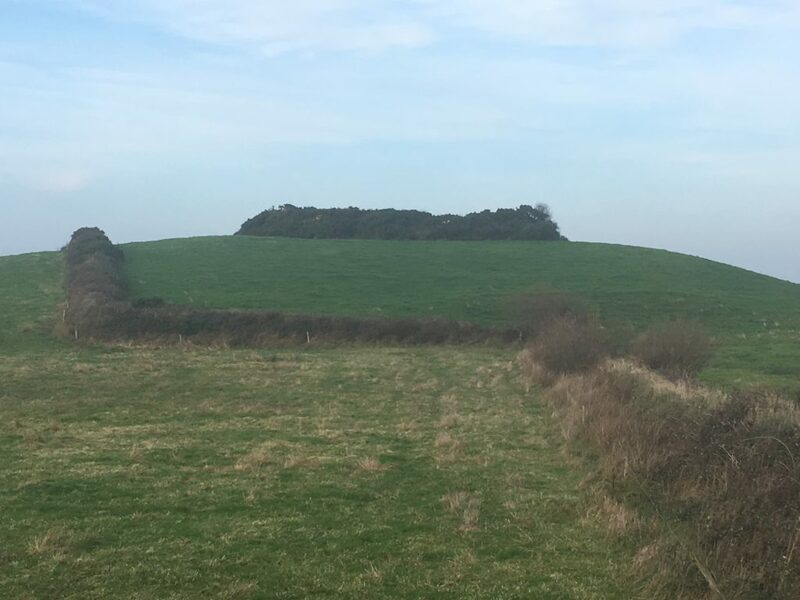 They only had a small plot of land and two or three cows, an dtuigeann tú? And they were living life honestly, as you say, and finally life turned against them. Yes and… One evening, Seán and his mother were sitting by the fire. “By my soul, mhuise don’t go,” said his Mother, she said. “By my soul I will,” he said. Well, she had to give in. “May God guide you a mhic ó,” she said. Well, he went- he went to sleep- they went to sleep that night ní nach iontach, and it was a bright, moonlit night. And they went upstairs to look out the window, to see if it was day, an dtuigeann tú? Oh, very close. The moon. Yes, and em what do we call the stars gathered together? They were there, and it wasn’t- wasn’t- it wasn’t long before Seán was asleep, his ear was only on the pillow and he was asleep, an dtuigeann tú mé, fast asleep. He was snoring, snoring away in his sleep until he woke and looked out the window. Dhera, and it was bright as day. He jumped out of bed and dressed himself and everything was put all over the place on the floor. There was no tea made at the time. Or any bread, a bit of stampy or something like, an dtuigeann tú? And he got up and got himself ready and he ate a bit of stampy and a mug or a couple of mugs of (liúnacht) and he went out and got a stick from the barn and out he went and drove one of the cows out before him. On he went…on his own… heading for… for- for- for… Oh, what do we call it… Heading for Kilrush. But on and on he went until he came to a place they call Lios na Fallainge. And when he came out in front of the Lios. He didn’t know if it was early or late, he hadn’t realised an dtuigeann tú? He thought it was day! And when he came right outside the Lios a little man who was not too big and not too small came out to greet Seán, The Widow’s Son Ó Réidhthe by first name and last name! “How’s that?” said the little man, he said. “You know me, but I don’t know you at all!” said Seán, he said. “Dhera, I’m not in any hurry!” said the little man, he said. “Look,” he said, “You must be going to sell that cow at the fair,” he said. “By my soul I am,” said Seán he said. “What kind of treasure is it?” said Seán, he said. “And… keep at it, and it’ll fall, the flour, the flour will fall out of it,” he said. “And are you happy?” he said. “I’d say that I am,” said Seán, he said. “It’s a deal!” he said. All was well. A close relation to his mother lived between Lios na Fallainge and Cnoc Réidhthe. And she was- she was very well to do. And Seán called her by the name of Beití Ní Bhriain. D/Narrator: Will they have enough to eat, and live happily ever after? for the rest of this 28 minute wonder-tale, full of magic, deceptive relatives, flour, fantasies of plenty, and retribution just pop over to our bonus features on the podcast. Angela Bourke: The two things that really struck me are his visual imagination and his timing and a lot of these stories, things happen in 3’s, as indeed they do here. This is a story about the widow and her only son and they are very poor, so he goes to sell one cow, and he ends up making a bargain with this little man who is not very big and not very small, who emerges out of this place, Lios na Fallainge, which would be an identifiable, or people would feel it should be identifiable. We haven’t been able to find it in the landscape, but that doesn’t mean it’s not there. Or that people didn’t know where it was. But this man emerges out of this place which is by definition in modern times not inhabited. But he comes out of there, he makes a bargain, he hands over this sieve. Then the 2nd time he hands over a magic table cloth and a wand, and the 3rd time it’s this wonderful array of magical objects – string that will tie somebody up, and a stick that’ll beat them and a harp that’ll play music. That idea of a harp that plays music, that can do magic, that you find in a very early medieval story where the Daghdha can put people to sleep and make people cry, and then make people laugh and fall around the place, by playing different tunes on a harp. But the 3 time tension of this – very often when you get stories published, the person publishing will say ‘he did as he did before’, but the storyteller will always – unless he has somebody really with cloth ears listening and he wants to get the hell out of there, the storyteller will give you the whole 3 things because of the suspense that he builds. 26.35 but then he comes back to his mother’s house, this is the first time, and this is the translation “on he went until he came to his mother’s little house, and he knocked on the door. The poor woman was wretched. So Tadhg O Murchadha interjects, he says “he went home to his mother”, and the storyteller says “yes”. But then we realise he doesn’t need any help, he isn’t having any problem remembering this. He went home and knocked on the door. She didn’t hear the first knock. But the 2nd knock she heard. Who’s there? She said. “Me”, said Sean. “Open up Mother, and let me in”. Ah sure, the poor woman got up reluctantly. So that sort of thing that he actually has him standing outside the door and his mother doesn’t hear the first knock, just like the image at the end where she is sieving so much of this flour, that comes from nowhere, through the magic sieve, that she ends up covered in flour, and the whole house is full of flour. He’s in the story. 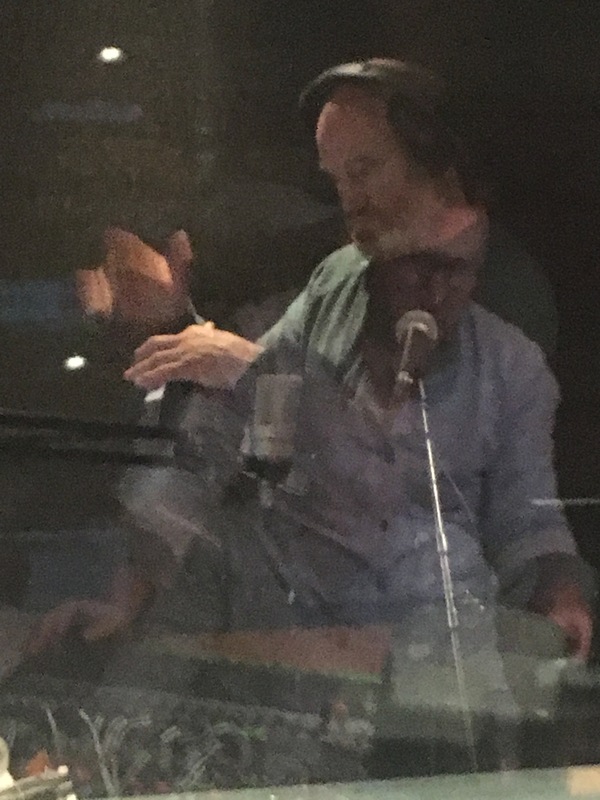 It’s a kind of a mindfulness technique, in a way in that he is completely in the story as he is telling it. And he is seeing it in front of his eyes. So I think he was a really good storyteller in his day. But then that art – there’s no call for it any more, nobody is interested. And so – you asked why we haven’t heard of him. We haven’t heard of too many of the storytellers. The ones we have heard of – it is mostly the people who study folklore who have heard of them – they were people who collectors collected a lot from, and published a book from. if Croaker won a prize at the Oireachtas he would have certainly come to the attention of the Folklore Commission. D/ Narrator: From Famine times where flour was a precious commodity, to the high modern technology of the Irish Folklore Commission recording van, with its own generator pulling up outside Croaker’s thatched cottage in 1950 – wizz kids Kevin Danaher, and Tadhg O Murchadha piling out! What a spectacle that must have been! 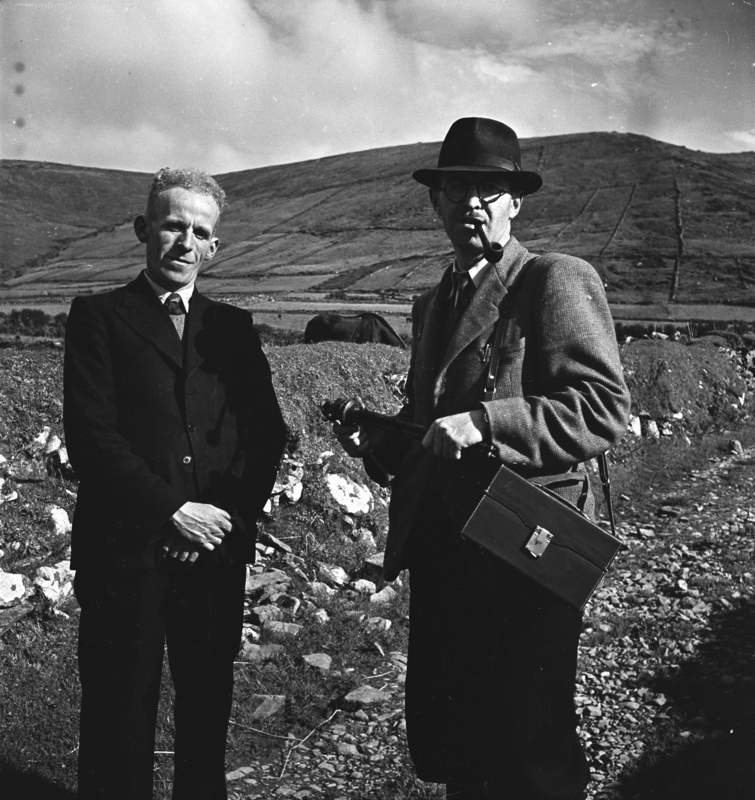 Angela Bourke Well Tadhg O Murchadha was a full time collector for the Irish Folklore Commission which was founded in 1935. He was one of the first people hired and he worked there then until the late 1950s, He was based in Waterville, County Kerry…. 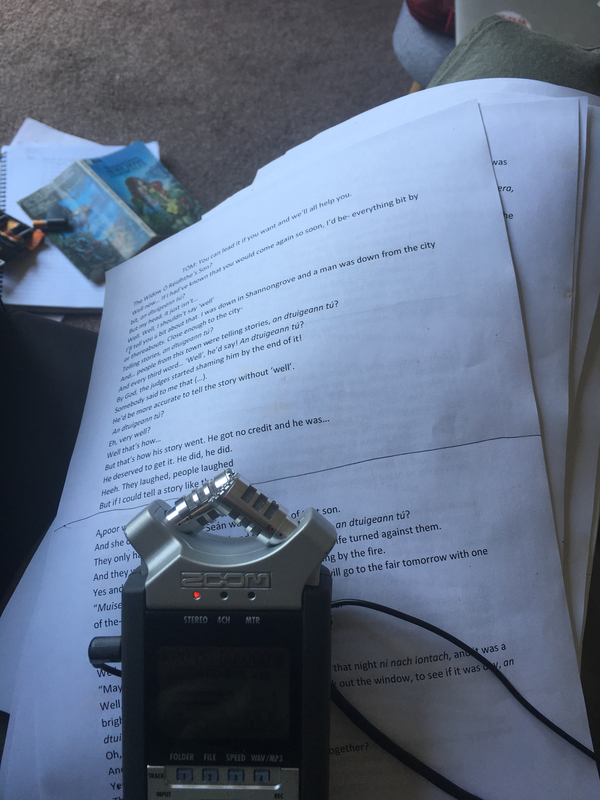 So Tadhg’s day job really was going around with an ediphone machine, recording storytellers, and then taking these recordings home. They were wax cylinders, which for most of the time they were using ediphones, had to be scraped off to be re-used so these sound recordings don’t exist any more. But Tadhg would have fared further afield. So clearly he went up to County Clare in 1943, and met Croaker the storyteller, the Seanchai in Coosheen he recorded him on the ediphone and then he transcribed that. So that manuscript that’s in the Folklore Archive from 1943, that’s Tadhg writing out what he has heard on the recording from Croaker. But then you come to 1950, and it’s a completely different ball game. Caoimhin O Danaher – Kevin Danaher – who was the sound engineer for this, as well as a photographer, he was a tremendously sophisticated, European focused, modern man. So this is not the ediphone, this is an acetate disc that you inscribe with your recording and then that can be kept. So that’s a permanent recording. the whole point about County Clare Irish was that it was disappearing. It was disappearing out of County Clare much faster than 6.54 it was disappearing than out of, say, West Kerry or Connemara, or West Donegal. The English language was making more inroads, maybe because County Clare had more towns, because really there are a lot of small towns in County Clare and wherever there were towns English was the language of the shops, English was the language of dealing with anything official. So when they wanted an example of Clare Irish then they would have come back to Croaker because Tadhg O Murchadha would have said well I met a storyteller in Coosheen, in County Clare, in 1943 who told me this story of The Widow’s Son and he had great Irish. In general we’ve a lot more to learn about the transition from Irish to English, and that’s why the O’Brien family is such a rich example of that. There’s a real tendency in Irish Studies to see that transition as inevitable. But of course any big cultural change isn’t inevitable to those who are experiencing it, and when we look at the information about Coosheen in 1911 we see that according to the census taken that year, there were some 154 inhabitants, 90% of those were bilingual, were self-declared as Irish and English. Indeed many of them filled out their forms in Irish to say they were bilingual speakers. Only 10 people in the area were English only and one an Irish only speaker. So that gives us a really good sense of transitional bilingualism in that period, in other words a period when both languages co-existed. And we see that clearly in the O’Brien family, where we can also see the change taking place. In 1911 Patrick O’Brien, a fisherman was 38 years old, and he and his wife Anne were both bilingual speakers. In 1911 they had 6 children, Paddy wasn’t yet born. The 4 older children were bilingual and their daughter Ellen who was then only 3 was being raised English only. So it’s a fascinating glimpse really into how the transition, and indeed the rupture, took place in that family. On the other hand languages survive in different ways, even when they are not readily apparent. 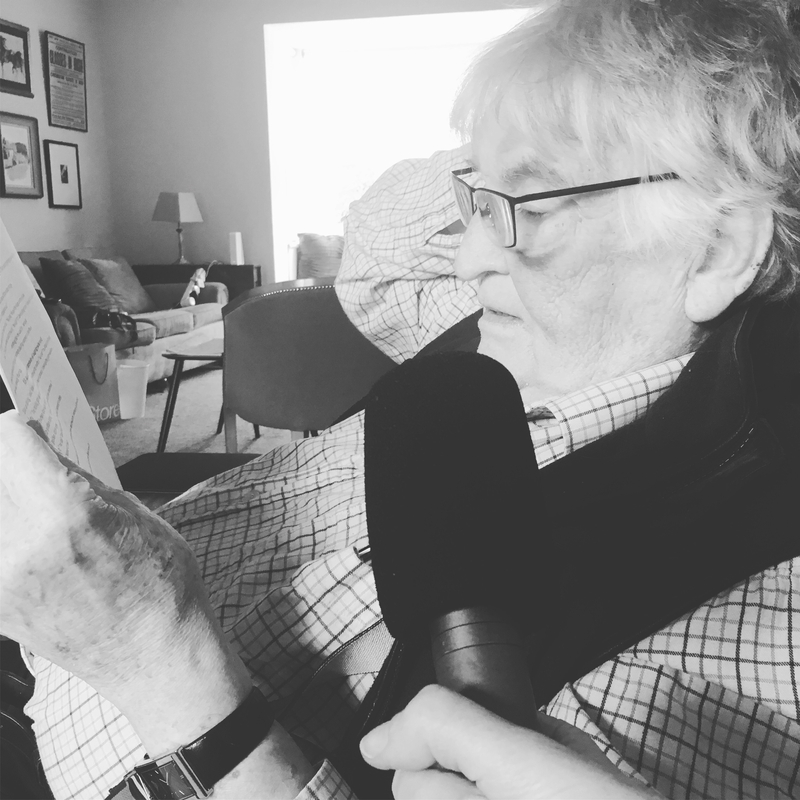 And I think we can hear in Paddy O’Brien’s own rich storytelling traces of Irish, most especially in the flexibility of his voice, the inventiveness of his voice, the power of his vocabulary, the flexibility of syntax. 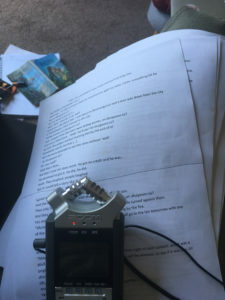 Brian Friel tells us in Translations, through the voice of Hugh, so wonderfully played by Ray McNally who, coincidentally had a house in Coosheen, in 1980 when the play was first produced, and Hugh says that Irish was a rich language full of mythologies of fantasy and hope and self-deception, a syntax opulent with tomorrows. Anne: I remember my great-grandmother, yeah. She never lost the Gaeltacht. I remember saying to myself “what is that lady saying?” Of course I was only starting going to school. But she’d forget about herself, right, and she’d often – she might be at the fireplace, in the open hearth, as we’d call it, and she might be fixing the bread and things mightn’t be going her way because that time with the open hearth you might be getting coals and turf and putting it here and there, and then she’d be giving out to the pot in Irish, or, you know, or giving out to herself in Irish if things didn’t go …. But my grandmother had a bit of Irish as well. A small bit. But once the English language came in, the Irish you know I think went into 2nd place. D/ Narrator: Anne’s great-grandmother, Ma Croaker was also renowned for her storytelling, and their house was a busy, open house where the Coosheen community would gather. Anne they were the first ones to buy a gramophone, and put on the music. 8.41 So that people could dance, you know? 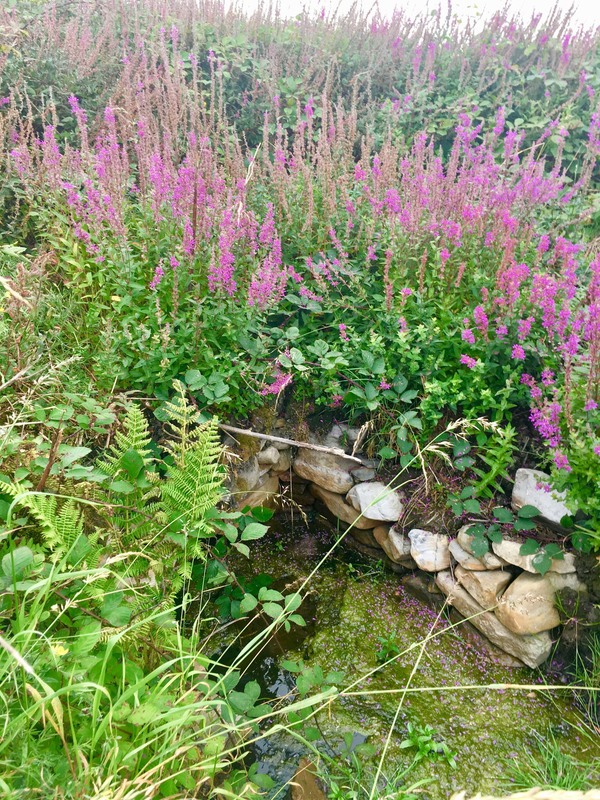 Anne Daly 9.25 – 10.34 : the Christian Brothers would come from June to September, they came up here, and they’d be out in front of the thatched cottage there, and he was teaching them the Irish. And then they’d go away, and then another one would come because my 9.41 grandmother said – “God knows”, she said, “you couldn’t go home, that place is crowded”. She was working at the Victoria as a Housekeeper, doing the bedrooms, and she said. I said well, “That was great, I said to her. “No”, she said, “God knows”, she said to me “You couldn’t go up home” she said to me “They’re all them old Christian Brothers are above” she said, “and the Lord bless us and save us” she said, you wouldn’t get room to move. 10.05 Then there might be a break of a day or two and she’d be happy enough. And then, they were back again. But – he was teaching Irish. All the time, and he was offered a teaching post above in the Gaeltacht, in Galway. To go up when they were building the house for him. So that he’d teach the Irish. But he was too comfortable – he was used to here and he wouldn’t go, so – that’s 10.32 the Croaker. Margaret Kelleher: There’s so much we don’t know about why people moved from one language to the other. In many ways we can only speculate, but one of the more important forces must have been economic ones. The old proverb “Irish doesn’t sell the cow”. And clearly, economic reasons, the possibility of doing well in another country would have been a motivation to move from speaking Irish to speaking English. My own sense is that one of the great what might-have-beens in Irish culture is bilingualism. One of the great might-have-beens of Irish cultural history is a situation where people would have felt able to speak both languages. I think one of the saddest things looking back is that language was experienced as an either or… and that at a key point in our history it seemed to many people that to survive was to speak English. Anne Daly And going back through the centuries there was a lot of evictions for the people. A lot of them were put out of their homes. The families – old people, young people, children, – that’s where they were living. They were living over across the way, in the cliffs. And the caves with their few little pieces of whatever they had. Kett’s was the landlord. …. The family was Irish. He gave the left hand side, where the houses are, down to the sea. That’s how Coosheen came about. He just gave a strip of land and probably cobbled together some bit of maybe huts or wooden things or something. To get them in out of the elements for the weather. That was it. 9.07 That’s something I didn’t know until I was told it. Anne Daly He wanted to go to America. But at that time you would have to pass a medical, and he failed the medical. So – that was it. Who have lost their gallant chief. Jack Kennedy, loyal and true. D/ Narrator: Jackie Kennedy graciously responded with a thank-you note – but alas no green card was forthcoming for Paddy O’Brien, the uncrowned Bard of Coosheen. Scraping moss of the derelict sites. 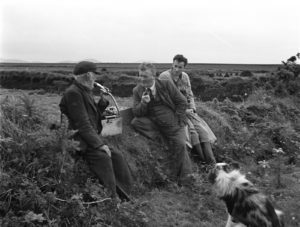 Bed of Clare Irish from the 1950 recording of Croaker & plaintive music by Rossa…. VAL GEARY A week before the accident happened, he stopped people going down to the cliff to pick slack. The sea was rough. So he advised them not to go. And they went away. But a week later the sea was even rougher, and he went down himself. But never came back. Now whether it was an accident, or intentional, no-one will ever know. But he was recovered 3 weeks later, on the Clougher. So that was the end of Paddy. VAL GEARY Paddy was missed terribly out of the village. ANNE DALY: anyone that did know him, it was very good to have met him on the way because he was a happy bloke, and he made a lot of people happy as well with his jokes, his music, his fun, his writing, and his wit. Yeah, yeah. Every house is as white as the snow. Hear Clare Irish from the 1950 recording of Croaker & music by Rossa…. Featuring Aonghus Og McNally, Pat Laffan, Val Geary, Anne Daly, Angela Bourke, and Margaret Kelleher. 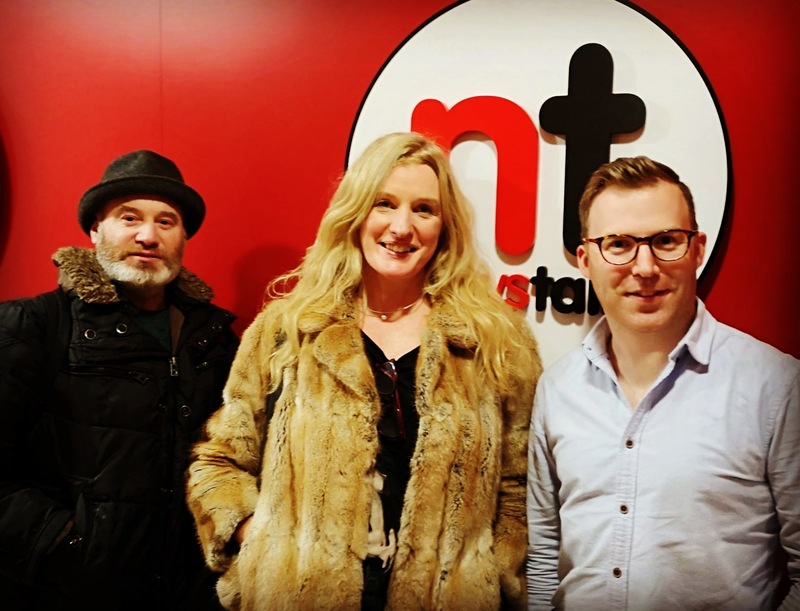 Rossa O Snodaigh, Deirdre Mulrooney, & Neil Kavanagh after recording the score in Newstalk Studio, November 2018. Funded by Broadcasting Authority of Ireland Sound & Vision Fund.